This isn’t good news. One of the nicest men in camp, Eric Campbell, who was a huge help in every position in 2014, now finds himself on the brink of being sent to AAA. The Mets have. reported to be strongly considering carrying eight relievers with them as they enter the starting gate. The eight men pen includes three lefties, Alex Torres, Jerry Blevins and Sean Gilmartin. Of those three, Gilmartin is the only potential player to not make the team. 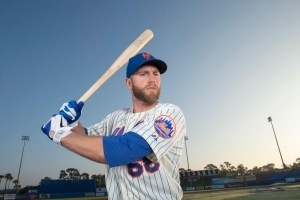 To the righties, Buddy Carlyle, who was extremely impressive in spring, might, just barely, make the team with the Mets. If the Mets bring along both Carlyle and Gilmartin, which makes sense because, A) Carlyle has had an amazing spring, and will have to pass through waivers or opt-out of his contract if he doesn’t make the MLB Team, and B) Gilmartin gets sent back to the Twins per the Rule 5 Draft, so it’s in your best interest to see who you have before letting him walk to another team. This, by default, means that the Mets will only be able to carry four bench position players. The locks are Anthony Recker, (or technically Monell, we just know one spot goes to a backup catcher) John Mayberry Jr, Ruben Tejada and then Kirk Nieuwenhuis, who is out of options. This leaves the super utility, highly praised, clutch, Eric Campbell, who has options, so they won’t lose him by temporarily demoting him, as the odd man out. I would hate to see this happen, but, if the Mets want to carry eight relievers, this makes sense. Also, with injuries, and the expected demotion of at least one of the bullpen men once we get, say, two to three weeks in, Campbell will be in the Majors in no time. It’s a shame, though, because no one has put more work and effort in like Eric Campbell.